As Heartland by Gabriel Jason Dean opens, the audience is introduced to Dirk Durosette’s inventive and metaphoric set constructed mainly of old books. On this set is a comfortably dressed, Dr. Harold Banks (played with alternating clarity and confusion by Philly veteran, Tim Moyer). Dr. Banks is a renowned professor of Central Asian Literature at the University of Nebraska. He is surprised by a visit from an Afghan refugee Nazrullah who claims to know Harold’s adopted daughter, Getee, an Afghan-American foreign aid worker. Nazrullah says that he promised Getee that he would come and take care of her failing father. 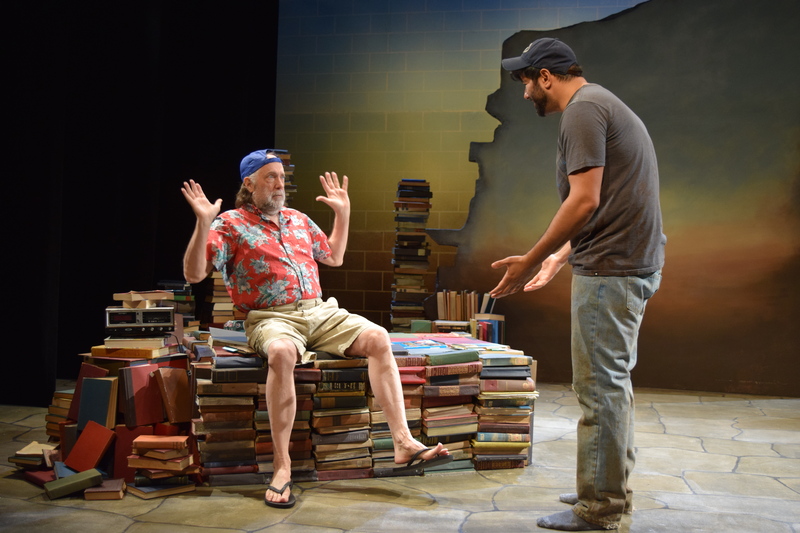 The play which was commissioned by the National New Play Network and developed at the Play Penn’s 2016 Conference, chronicles the next several months as the unlikely roommates share stories of Afghanistan and especially Getee who had been killed in a Taliban attack. Through their experience they discover that Dr. Banks had been involved in a CIA plot using textbook for Afghan school children. The textbooks contained violent images and militant Islamic teachings. They were intended to exacerbate the Afghan resistance against the USSR. Heartland takes the audience on a journey through love, loss, blame, guilt, and ultimately forgiveness for the sins of our past. The exchanges between Banks and Nazrullah (played with impressive subtlety and charm by Yousof Sultani) are heartfelt and poignant. As their friendship develops the audience’s knowledge of the cultures grow. As Getee, Nazli Sarpkaya turns in a calculated and appropriately fearful performance. She and Sultani have some impressive exchanges in the native languages where although the audience doesn’t speak the language, their “sound of sense” is so good that one finds himself or herself understanding clearly what is said. Katherine Futz (Costumes), Maria Shaplin (Lighting Design), Michael Kiley (Sound Designer), and Kat Wheary (Properties Designer) all complement Durosette’s stage and Director Evren Odcikin’s gifted and well-paced vision of the play. It runs an hour and forty minutes with no intermission, but the time flies by and the emotions are real. Heartland runs until April 21st at the Louis Bluver Proscenium Theater at the Drake. For information call the Box Office 215-568-8079 or email: Boxoffice@interacttheatre.org.